Dynamite has sent us a new writer’s commentary by Amy Chu as she takes us behind the scenes of the new Dejah Thoris #0 with cover by Jay Anacleto with interiors by Pasquale Qualano. 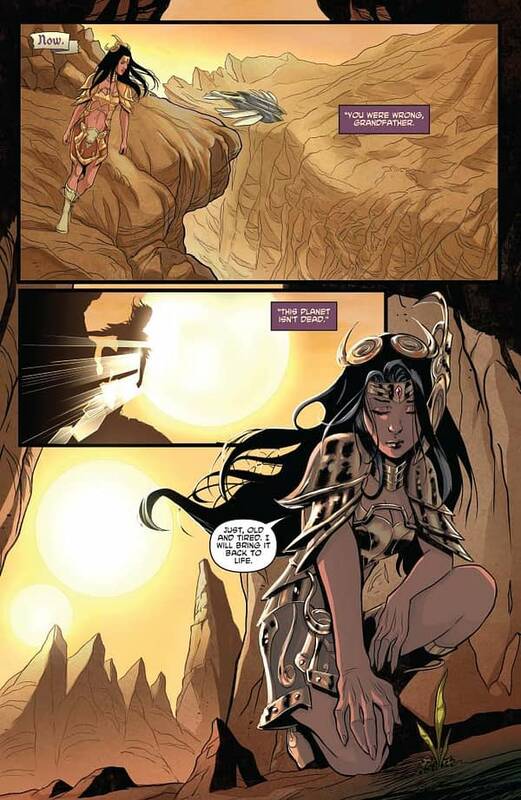 Here it is, my behind the scenes commentary for the all new Dejah Thoris #0. First of all, I’m so glad so many of you have already read and liked it. It’s really nerve-wracking for us comics creators (and I’m sure the publishers and editors, too) to launch or relaunch a series and wait for the love it/hate it/meh public reaction. So a big thank-you for the warm reception. Before I start, here’s a little inspiring trivia about Edgar Rice Burroughs for the aspiring creators out there. He started his writing career at the age of 36, and this was after pretty much failing at everything else. While selling pencil sharpeners to stores (pencil sharpeners! ), he started writing what would become his first book, A Princess of Mars, which became a huge hit. I got the idea for this Princess of Mars story by going back to that source material. (By the way, you can read all the books yourself for free on gutenberg.org.) I noticed this little passage in the original 1917 text where the Dejah Thoris character is first introduced. Hello?! Scientific research expedition? I read onwards and never has this seemed to be mentioned or addressed again, so this expedition became my pitch to Dynamite: an Indiana Jones-style prequel with a scientific research team trying to save the planet. After the pitch got approved, Dynamite told me they wanted to do an introductory 25 cent #0 issue just like Red Sonja. Fun fact: It costs Dynamite more than that to publish each copy, so they are taking a leap of faith that you will like it and put it on your pull list. So if you didn’t, please do! This is great news for the series, but tough to pull off as a writer. I have to 1) make a stand-alone story that 2) also introduces new readers to a franchise 3) without boring old fans, 4) gets everyone excited about a whole new fresh storyline to come, and finally, 5) must fit within 16 pages. So let’s dive into those 16 pages, okay? We start of with a little intro to the world of Barsoom. A lot of readers will already be familiar with this fictional planet of Mars, but I wanted to make sure those visiting this world for the first time have a good time and plan to stay. So I cover a bit of Barsoomian history in the form of Dejah’s grandfather telling a bedtime story. 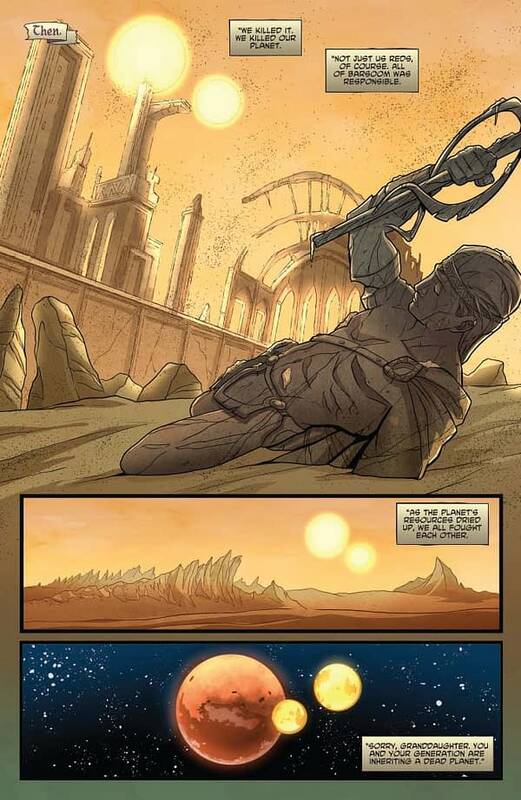 More Barsoom but from the past. Note, all this came out of Pasquale’s vivid imagination — I really gave no description or guidance except for maybe a few photo references here and there. 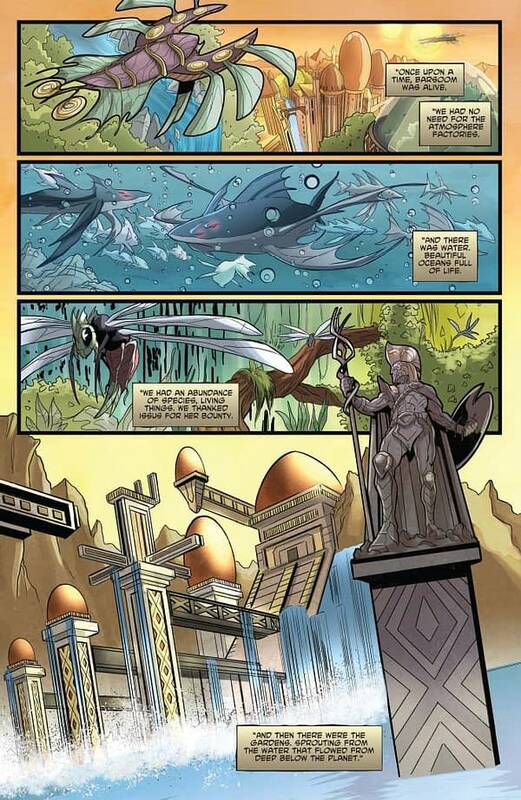 And here is where super artist Valentina Pino shows off her coloring chops. A fun exercise for readers. In comics, typically colors end up printing darker and muddier and unfortunately the colorists have no control over that. But they do for the digital version. If you look at the digital version you can get a better indication of what the colorist had in mind often times more than the printed version. 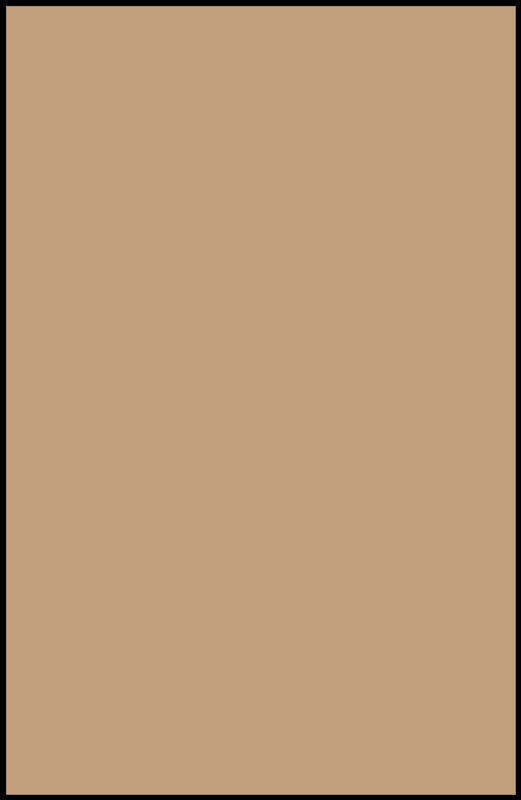 Take a moment to download a digital copy of Dejah Thoris #0 from Comixology (it’s free), and compare the colors for yourself. 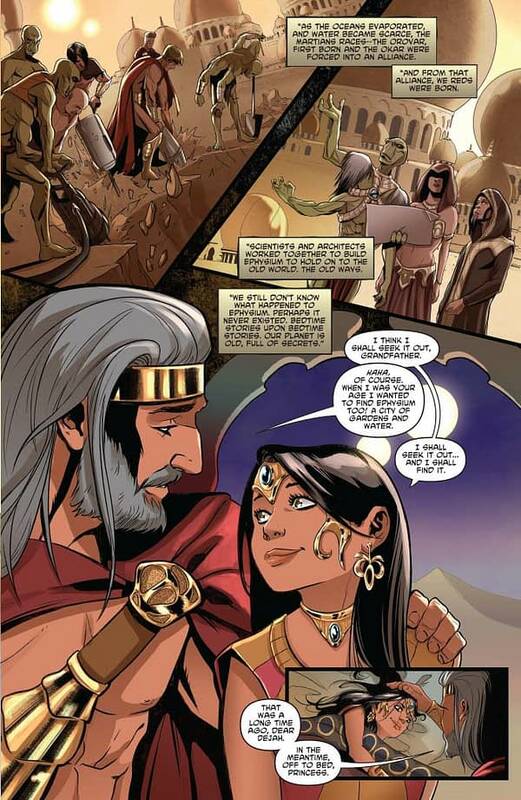 Here we meet Dejah Thoris for the first time, as a young girl listening to her grandfather’s stories. Uh oh, dad’s home early…! And he’s brought a present. Who wouldn’t want a white ape for their collection?! Dad’s about to school his naive daughter on the realities of this world. The planet is a harsh place. In the original script, I had her sneaking by the guards, which the editors had a hard time with, and it’s true. There really wasn’t the space for it to work effectively either. We settled on a secret passageway which I thought at first was too convenient, but hey, this is an old palace with a lot of secrets, so why not? And who is this mysterious green stranger? 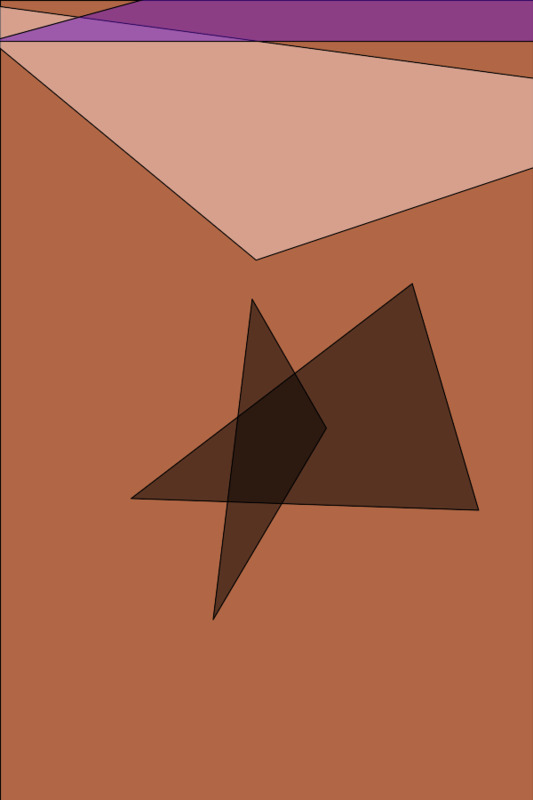 There’s been some speculation on this character in the interwebs … stay tuned on that one. Just a regular family dinner time conversation … with Dad and Gramps ganging up on Dejah. Nice semi-splash page for Pasquale. Again for aspiring writers out there, make sure your script has fun things for the artist to draw. They will thank you for it! Now lest you forget, #TeamDejah is artist Pasquale Qualano, color artist Valentina Pinto and letterer Tom Napolitano. This is comics not prose, so please give these pros all the proper credit in your glowing reviews, and definitely follow them on social media. You will be rewarded, I’m sure, by sneak peeks at things to come! Now I have to get back to writing Issue #4 where stuff really gets crazy in Barsoom! I hope you enjoyed following along! If you will be at Planet Comicon in Kansas City, Emerald City in Seattle or C2E2 in Chicago, please look for me. I will be happy to sign your Dejah Thoris and maybe even show you what I’m working on!